Earning a PhD is accomplishment enough for most graduate students, but three recent Arts and Sciences grads received the A&S Graduate Medal along with their doctorates this spring. Here’s a look at their accomplishments in the fields of comparative literature, physics, and gender, women and sexuality studies. Martha Gonzalez. Photo by Isaiah Brookshire. Gonzalez’s PhD dissertation, “Chican@ Artivistas: East Los Angeles Trenches Transborder Tactics,” concerns the development of Chicana music in East Los Angeles from the 1990s to the present. “In addition to music theory and Chicana feminist theory, I was surprised and blown away by Martha’s use of feminist development theory [in her dissertation],” comments Priti Ramamurthy, chair of the Department of Gender, Women and Sexuality Studies. “Martha’s scholarship is rich, highly original, and provocative. 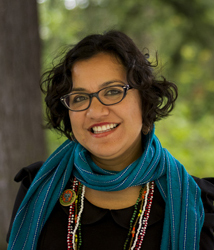 It combines social scientific and humanistic approaches, and it brings a unique voice and perspective to studies of labor, economic development, and social movements.” Gonzalez came to the UW as a Fulbright scholar and later received a Ford Dissertation Fellowship.